Sitting the jars of salted kumquats over a sunny window sill for at least 1 month or longer before using. 450gm cleaned and dried kumquats and enough coarse salt to cover the fruits. 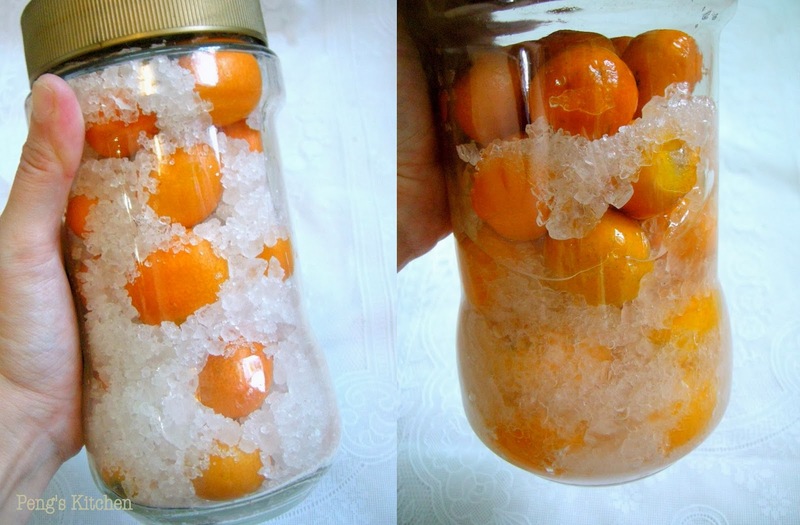 Layer the kumquats and salt alternatively in a clean and sterilised jar. Seal the jar and place it near a bright window sill. Overturn the jars occasionally to allow the salted brine to distribute evenly over the kumquats. Let it cure for at least a month or longer until the fruits shrivelled and softened before transferring the jar to fridge. Making of salted kumquat drink! Salted kumquat drink : Mash 1 kumquat thoroughly in a glass. Add in 2 tsp honey to taste and top with a cup of cold water. Refreshing! 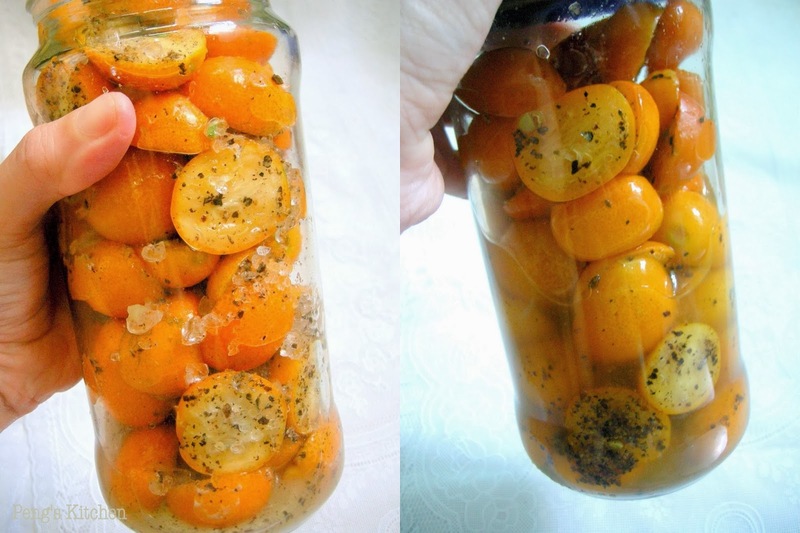 I found another preserved kumquats on another web-site, these preserved kumquats are served as a relish rather than using it to make as a drink. The process of curing is shorter, around 2 weeks, as to retain its crunchiness. Wash the kumquats and air dry completely. Slice half in lengthwise. In a bowl, combine halved kumquats, peppper, cloves, salt & sugar till evenly mixed. Place kumquats in a clean dry jar, pour in lemon juice and seal the jar. Store at room temperature for 10 days to 2 weeks, shake the jar once a day, until they reach the desired softness. Chill the mixture. To use : using a clean, dry spoon, take out desired amount and rinse under cold water, chop or serve whole along with roasted meat or toss into salads.